Diamond Bank, with its head office in Lagos, has emerged as one of the leading banks in Nigeria, having grown significantly in size and assets since its incorporation in 1991. By focusing on new technologies and targeting specific customer groups with innovative products, the bank has quickly risen as a major player in the industry, threatening the stronghold of Nigeria’s traditional top-tier banks. With a growing footprint in west Africa, Diamond Bank is keen to continue its expansion by betting on Africa’s booming economy and by investing in the unbanked. “Diamond Bank is strategically positioned to deploy cutting-edge technology, in the growth of the retail segment of its business. This in turn, will provide a wide range of unrivalled convenience in our retail products and services,” explained the Bank’s Group Managing Director and CEO, Dr Alex Otti in an interview with World Finance. For Otti and Diamond Bank, retail banking means supporting the individual as well as the small business, as both segments are at the heart of its new retail strategy. The bank’s ideology lies in its understanding of the future for retail banking with a huge focus on a wide range of customer segmentations, which provide various products and propositions to serve each segment; youth and school banking, mass market, affluent, privilege and MSME (micro, small and medium scale enterprises). Consequently, its medium-term retail strategy initiated in 2008 has delivered significant results evidenced by a phenomenal 125 percent growth in retail deposits between December 2010 and December 2013. The bank currently has over 240 branches in Nigeria in addition to subsidiaries in Benin, Senegal, Côte d’Ivoire, Togo and the UK. Diamond Bank was first listed on the Nigerian Stock Exchange in 2005 and in January 2008, its global depositary receipt was listed on the Professional Securities Market of the London Stock Exchange. Diamond Bank was the first bank in Africa to record that feat. Although the bank’s business focus consists of corporate, retail and public sector businesses, retail remains the largest part of the bank’s business and by leveraging the SMEs’ footprints, the bank hopes to capitalise on the impending economic boom to further drive its retail portfolio. “Our deep understanding of the retail sector has availed us valuable insights into the challenges of the market. This has driven our innovations in e-banking, which has become the core of our business strategy in promoting a seamless transition to a cashless economy. We have continuously invested in top-of-the-range technology deployed via robust platforms to provide safer, faster and more convenient services to the banking public,” said Otti. In this respect, the bank is making its mark on the Nigerian financial industry, which is experiencing growing competition in the area of technological innovations designed to make everyday banking more convenient for customers. With a large part of the population based in rural areas, it can be quite cumbersome trying to reach the entire retail segment through branch network alone. As such, Diamond Bank has launched a series of alternate banking channels including the Diamond Mobile App, Diamond Pay, Diamond Online and Diamond Mobile, which all allow customers to transfer funds, pay bills and conduct a host of banking transactions from computers or mobile devices (see Fig.1). All of these innovations are instituted in order to further the financial inclusion drive in Nigeria, where over 70-80 million potential customers still remain unbanked. This has resulted in a robust retail engagement strategy to serve the unbanked and underserved segment across the country. “As part of our retail innovation, we have integrated agency banking into our core business model. For example, our Beta Savings Proposition was designed to offer a simple savings account driven by mobile technology and a nationwide network of agents, who act as touch points to reach the financially excluded from petty traders to artisans. Furthermore, in partnership with MTN, we developed the Diamond Yello Account, which offers our customers a safe means of opening and operating a full bank account on their mobile phones, thus eliminating the need for documentation and the discomfort of locating a branch,” said Otti. 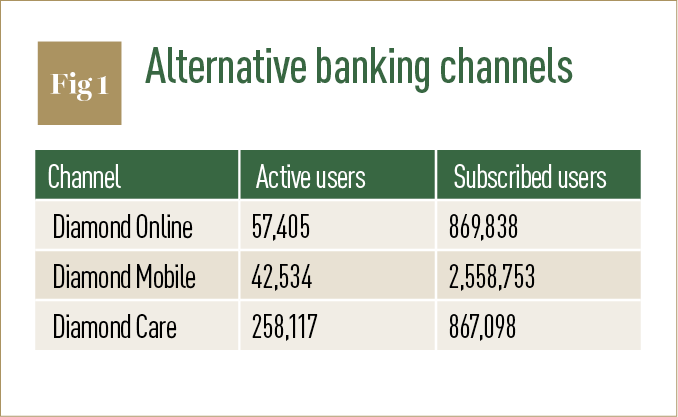 Particularly interesting is the alternative customer channel agent banking offering, which provide customers access to financial services at convenient locations such as supermarkets, schools, cinemas, markets and restaurants. The phenomenon is increasingly popular with Nigerian banks and seems to be gaining traction with customers who are flowing into banks such as Diamond Bank. 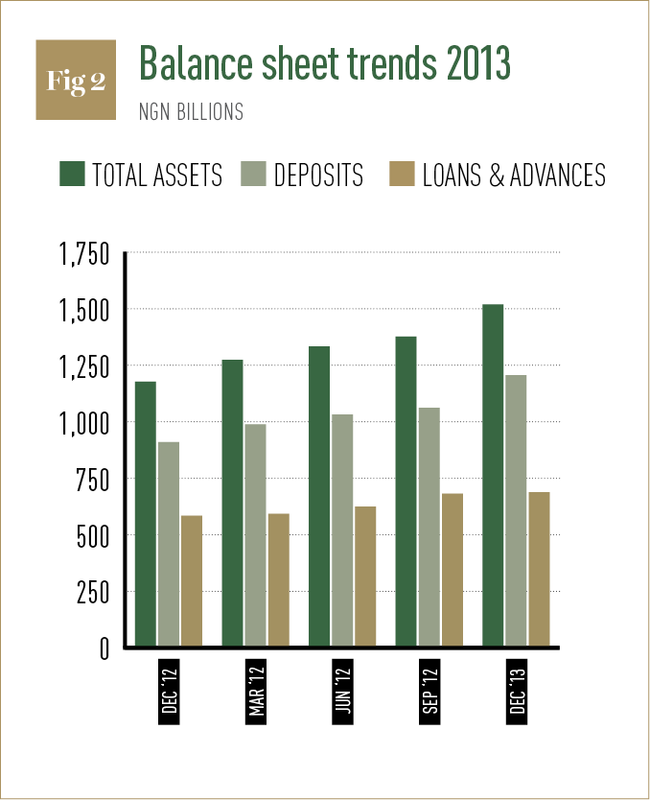 Since 2012, the bank has gone from being Nigeria’s 10th largest bank by assets, to its seventh largest by the end of 2013, largely because of its NGN1.5trn in assets (see Fig.2) – the majority deriving from its growing retail business. The bank has also embarked on the continuous development of women-friendly propositions and services aimed at empowering women economically. This includes the launch of the Diamond Woman Proposition, a fully fledged business support initiative designed to empower its female customers by building their capacity in managing their finances, family life, career and businesses through platforms such as seminars, conferences, networking events, and an active online community. “Our ultimate goal is to provide suitable solutions for all types of customers, keeping each satisfied at every touch point and continuously stimulating an enabling business climate that would encourage real development in every financial centre that we operate in,” said Otti on the need to offer a vast collection of services that can accommodate the varied and growing wealth of the Nigerian population. To this end, Diamond Bank has made it a key point to embrace small businesses in its search for strong business growth. The bank has an elaborate MSME offering which provides the resources entrepreneurs need to grow their businesses, in addition to tools that facilitate-commerce and market visibility. Customers are provided with a unique website address, transaction services and investment accounts/instruments, lending, cash management, and trade and financial advisory services, through its nationwide branches. What’s more, a team of experienced business bankers with industry specific expertise give MSME customers invaluable insight into their target market and the opportunities that exist for that particular business. The aim is to help customers promote their business to a broader audience, buy and sell a wide range of products online and find potential business partners, suppliers etc. For Diamond Bank, this venture is set to be the key driver of profit growth in the coming years – despite the volatility associated with SMEs. The bank’s commitment to give back to the community and foster economic development in Nigeria comes at a crucial time for the African economy. Nigeria is currently considered the largest economy in Africa and has an immense growth potential due to its vast resources and trade markets. Its financial services industry is well developed and has in last two years identified high-growth potential among the teeming unbanked individuals. To this end, technological initiatives, agency banking and the promotion of MSME businesses, is a crucial way to bank and increase the wealth of the Nigerian population, which is at the cusp of an economic boom and will need all these financial services for years to come.